Like on a real playing field but on a few enough m2. PLAY to forget the boredom and pain of effort, with a virtual or real partner. The sport simulator Omboxx is a software that is running sport video. It is designed to create a true interaction between a player-sportsman who instead of running on the ground is pedaling on a SpinBike, and a video game of Squash category. Pedal quickly to run in the virtual game. To move around the video game player- athlete must pedal faster or slower depending on the levels . He must play the ball with strength, speed and amplitude of movement required . Transform the practice of cardio training in playful activity as on a true playground of squash or another ball sport practiced indoors. On a space of a few m2 sport player is thrown into a virtual world that asks very real efforts whose intensity adapted to each is virtually unlimited . In this playful context , interacting with his own efforts and a real or virtual opponent , the player – sportsman forget the time and intensity of effort to focus on his game. 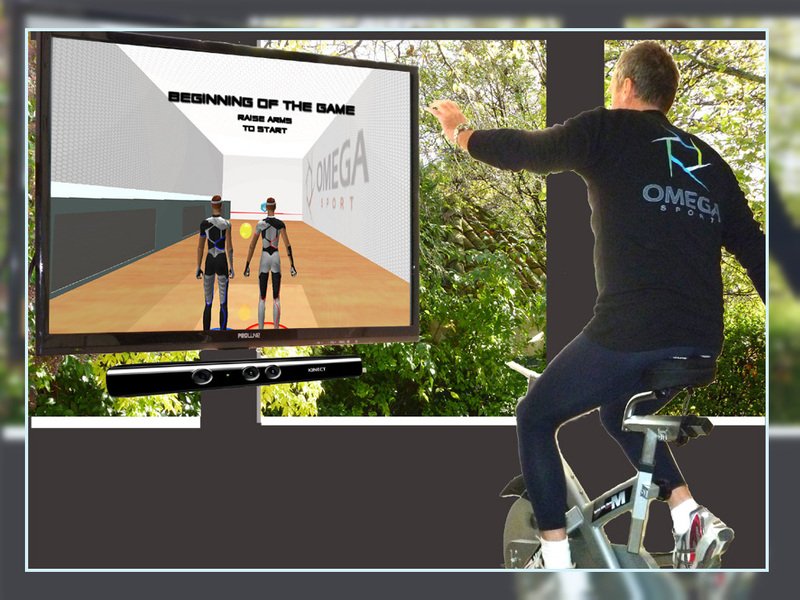 A Kinect for Windows captures the right speed of pedaling player – sportman and all its movements. The data collected are transmitted and integrated by the software to be implemented in the course of gaming. The practice of regular activity is now recognized medically as the best way to fight against the effects of age (lower hormone levels ) , cardiovascular diseases, stress, Alzheimer’s disease, bone and muscle loss. This practice should be regular and sustained to be effective and the main obstacles to the quality of the practice are boredom , poor adaptation of sports facilities , lack of time and motivation . Our concept is to provide an activity that is both fun , friendly and can be extremely intense depending on the wishes and abilities. The sports player may be monitored cardio and a prototype has already been developed to include the heart rate in the settings of interactivity of the game. The game itself is based on a trinquet game with bare hands witch is one of the aspects of Basque pelota. It can be practiced alone, against the computer or against a real opponent in the room or online. The sports player is immersed in a fun and interactive game, it does not count his effort and time passes quickly . The implementation of the simulator sports Omboxx can be done independently or in combination with other sports equipment , for example, induce additional weights on the arms. For more informations about our products or futur products under development, please feel free to contact us.